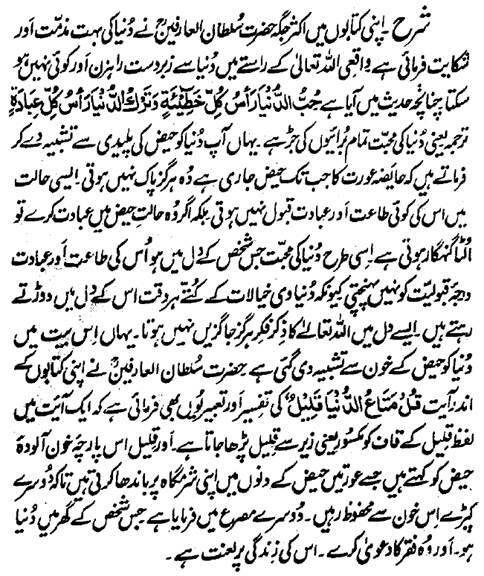 Hazrat Sultan Bahu Rahmatu-Allahe Ta-aala Alaihe has condemned Dunya (World) in many of his blessed books. Verily, there can be no hurdle bigger and a brigand mighty than Dunya (World) in the course of Allah Almighty. 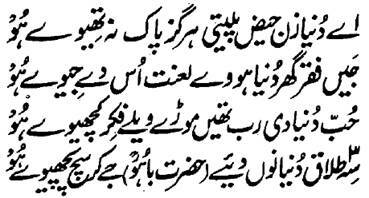 The Tark of Dunya (World) is the climax of all worships and Liking for Dunya (World) is the origin of all sins. Here, Sultan Sahib Rahmatu-Allahe Ta-aala Alaihe has resembled Dunya (World) with the impurity of menstruation blood of women that a woman cannot become pure until her menstruation bleeding has not stopped. Her worship is not acceptable in such condition. Instead, if she offers worship in this condition, she becomes a sinner. Same as to this, that person, in whose heart is the Liking for Dunya (World), his worship cannot touch the pole of acceptance because the dogs of worldly thoughts all the time run in his heart and the Zikr Fikr of Allah Almighty cannot establish in such heart. In his books, Hazrat Sultan Bahu Rahmatu-Allahe Ta-aala Alaihe , has explained the word 'Qaleel' of this verse (4:77) in the sense that the word Qaleel is pronounced with Zair and Qaleel is called that piece of cloth which women use as menstrual pad so that the outer garments should stay safe against this blood. Hence, accused is the life of that person, who keeps Dunya (World) in his house and also claims to be the adherent of Faqar.